Print LabelsHave us print your images on the labels sheets for you. Are you creating a new game for the Atari 2600/5200/7800 video game systems? Do you have a missing label that you want to replace? Do you want to personalize a cartridge for that special somebody? Well look no further! We now offer blank labels for the Atari 2600/5200/7800 cartridges by Atari. Each sheet has four top and end labels. 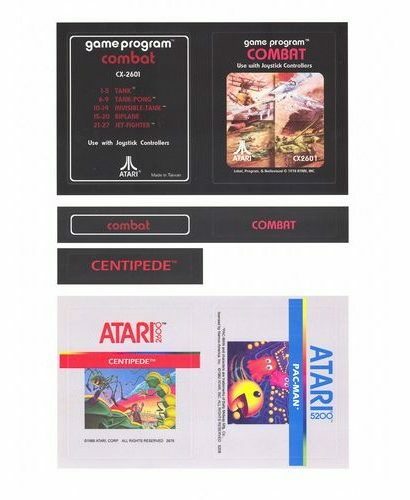 These labels might fit on others, but have been customized and produced to fit exactly on Atari cartridges. The labels are produced on high quality gloss stock with rounded corners and sticky backs. Very professional looking! For us to print, please select Laser as label type, then select Yes (Per Sheet) under printing. Avery Label Maker Software (see Instructions). Check out our Homebrew Community with more samples and templates! NOTE on us printing: If you would like us to print reproduction labels, they need to clearly state “Reproduction Label” someplace on the label itself. We do not keep a supply of reproduction label images but if individuals want to share what they have created, we can create an area on our site for them. Please contact us if interested in this.